These pages offer news and information regarding my work as a musician and music teacher. I do hope that you will find this site useful and helpful. For those looking for Music Tuition I would invite you to explore the Tuition Pages and also Testimonials of Pupils & Parents of Pupils (below & on the Testimonials Page). Regarding my tuition work there are pages of information regarding my private teaching practice & work within schools here in Norfolk. I am a registered and full member of the ISM (Incorporated Society of Musicians) and the Musicians Union. Having been tutored and inspired by such wonderful teachers and many colleagues over the years I regard it a privilege and a joy to now pass on to a new generation the skills & experience that I have accumulated during a lifetime of study & application. I offer tuition on Saxophone (to Diploma standard), Flute, Clarinet, Piano & Music Theory. A good number of my pupils have reached advanced levels of playing and have been awarded top prizes in local, regional and national music festivals & competitions. These include the Norfolk County Music Festival, Norfolk Young Musician of the Year and the BBC Young Musician competition, where one of my pupils reached the woodwind semi-finals in Cardiff in 2014. In addition to these events some of my pupils have also been awarded places in various music academies and programmes such as: Guildhall School of Music, Junior Guildhall (which is a weekly Saturday school), the National Youth Jazz Collective and Aldeburgh Young Musicians. I am pleased to be part of the excellent Music Teaching team at Norwich School and also the NCYM (Norfolk Centre for Young Musicians). This is a Saturday Music School here in the City of Norwich (a partnership between Norfolk Music Service & the Guildhall School of Music & Drama) where I also direct the NCYM Jazz Ensemble & Saxophone Ensemble. 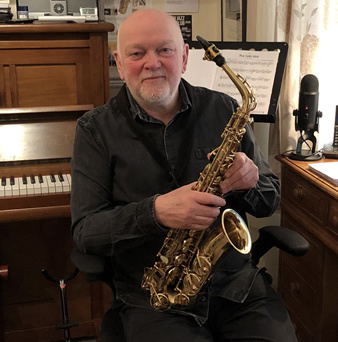 My own journey in music started with piano lessons (at a very early age with Evelyn Norman in my home town of Bishop`s Stortford) and then on (at the age of 15) to study for 3 years (Flute & Saxophone) at HM Royal Marines School of Music in Deal, Kent. After playing and travelling across the world with this most prestigious military band I then went on to work and to explore new and diverse musical traditions (more of this on my Biography page). Music for me is a passion, a God given gift. Over the years I have been privileged to work with so many fine musicians & song writers. In 1989, following visits to the Islands of Lindisfarne & Iona (where I discovered something of our Celtic Christian Heritage), I formed (with my good friend & fellow collaborator Dave Bainbridge) the Celtic fusion band IONA. This was a highly creative period, years that I treasure to this day. I invite you to explore this website to discover more of my story, my work and of my passion for music and creativity. The song on the video (below) is called Chi-Rho and the film was a promo for the second project that I recorded with IONA (entitled `The Book Of Kells` and was initially inspired by that great Celtic Illuminated Manuscript). A Wonderful Teacher. My daughter had music lessons with David Fitzgerald from the age of 11 to 18. Charlotte gained grade 8 in music and now attends a London college studying for a degree in actor/musicianship. David is a wonderful teacher always making lessons enjoyable. I would not have any hesitation in recommending him. Outstanding Teacher. David taught me alto saxophone for more than 8 years. He saw me though my grades but best of all introduced me to Jazz which became all we played. He creates a very relaxed atmosphere but also is willing to challenge and work you hard to progress your playing. Many of the saxophonists I have played with in various jazz bands with have been taught by him. A true legendary teacher! An Outstanding Teacher. My son has had lessons with David for over five years and he is now at a Conservatoire. His tuition has been outstanding and his attention to detail is excellent. He has taken my son through to Grade 8 and a Diploma and given fantastic career advice. He has gone out of his way to introduce my son to different challenges including Young Norfolk Musician of the Year. A fantastic teacher who I cannot rate highly enough. Patient & Encouraging. I can recommend David without reservation. He took me through from Grade 6 to Diploma level and really challenged me. The lessons were really enjoyable and he was always patient and encouraging. My sight reading really improved as did my tone. I am now at a Conservatoire and David continues to be a great support to my musical development.